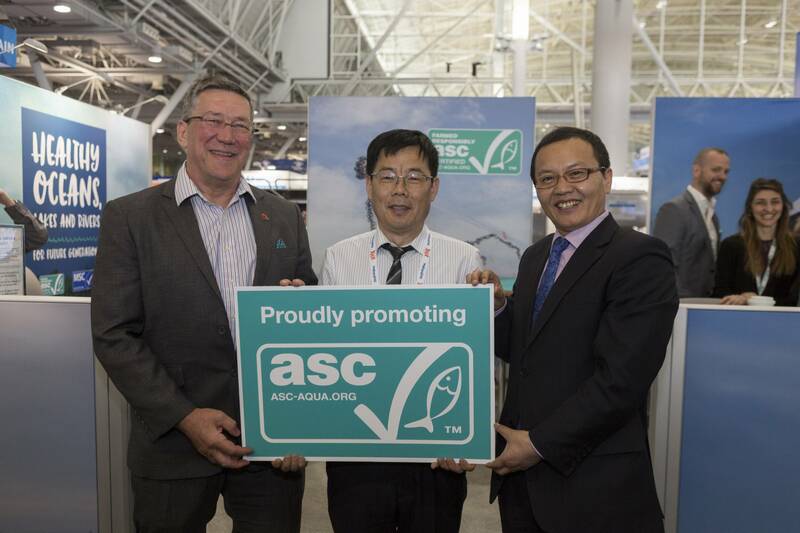 Seafood Expo North America (SENA) is the largest seafood trade event in North America, but on Monday afternoon the focus was on China, as Green Life Foods Co., Ltd. was welcomed to the Aquaculture Stewardship Council (ASC) by CEO Chris Ninnes. Green Life Foods achieved certification in 2018, becoming the first ASC certified mussel and oyster producer in China. The company made many adjustments to its production and processing practices to achieve ASC certification. One such improvement was the replacement of all Styrofoam floating rafts used over the 750 hectares of its production sites with sturdier and more durable ball rafts. These longer-lasting replacements will reduce an estimated two tons of plastic waste every year. Green Life Foods is also focusing on employee safety and providing opportunity for its community, providing over 100 jobs for women from local villages, who work on the preliminary processing of its farmed shellfish. “Green Life Foods is a company focusing on the export of canned smoked shellfish. The ASC certificate will help us win customers recognition and expand the markets in North America, Australia and Japan,” said Chen Weijiang, General Manager of Green Life Foods. Other ASC-certified products from China at SENA include the Chinese white shrimp of Zhanjiang Guolian Aquatic Products Co., Ltd., the tilapia of Guangdong Evergreen Conglomerate Co., Ltd., as well as tilapia products of many ASC-certified enterprises from Hainan Province of China. At present 11 Chinese enterprises have received ASC certification for their responsibly managed farms, and every year they provide the consumers in China, Europe, America and the Asia-Pacific Region with nearly 60,000 tons of responsible and sustainable seafood, including tilapia, bivalves and shrimp.